This is one of the most famous mélodies of all time, composed around 1870. 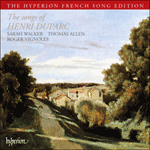 It was Duparc’s special role in the history of French song to introduce a note of depth and seriousness into a genre that had been notably lacking such qualities during the Second Empire. The inspiration with this composer was Wagnerian (Duparc heard Rheingold in 1869) but his music distils Wagner’s visionary qualities into works of art of great concision and translucence. In this unquestionably French music there is no trace of the megalomania and pomposity that repelled Godard and other French anti-Wagnerians. Duparc embraced the Christian ideals typical of the César Franck circle as a whole; perhaps that is why the pagan resonances of Baudelaire’s ‘Luxe, calme et volupté’ are turned into music of unbelievable refinement—here is purity as well as decadence, rigour and sensuality. With Baudelaire and Duparc we traverse the landscapes of the Dutch East Indies; as in all such journeys, where imagination plays the largest part, we find ourselves flying beyond operatic sets of wood and canvas towards realms previously inaccessible to the French duo of singer and pianist. 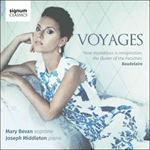 Decades earlier Schubert and Schumann had discovered those regions where the intimate fusion of great words and music worthy of them represents a special flowering of creative opportunity; with L’invitation au voyage French song comes of age and joins the German lied as something separate yet equal. of going to live there together. in the land which resembles you.